This magnificent residence graced by the double volume entrance and large sliding windows and doors is a haven for gazing at ocean and mountain views from multiple vantage points. The entrance with a sleek glass staircase draws you into a voluminous layout made for entertaining and takes advantage of the multipurpose reception areas. The house strives for simplicity using clean lines and unadorned finishes, a true concept of 'less is more'. Living is easy in this generously spacious residence. The floor plan encompasses 4 bedrooms and 5 bathrooms, versatile living areas, choice of a home office or live-in facilities, library and teenager pad and a stylish bright kitchen with high gloss cupboards, Caesar stone countertops and the laundry is conveniently adjoining the kitchen. The divine master suite presents an airy layout with natural light and is the ultimate retreat facing the ocean, complete with a generous shower, oval bath, big corner window excellent positioned for picturesque views over Gordons Bay, walk-in closet and sliding doors onto a private covered balcony with sweeping views. 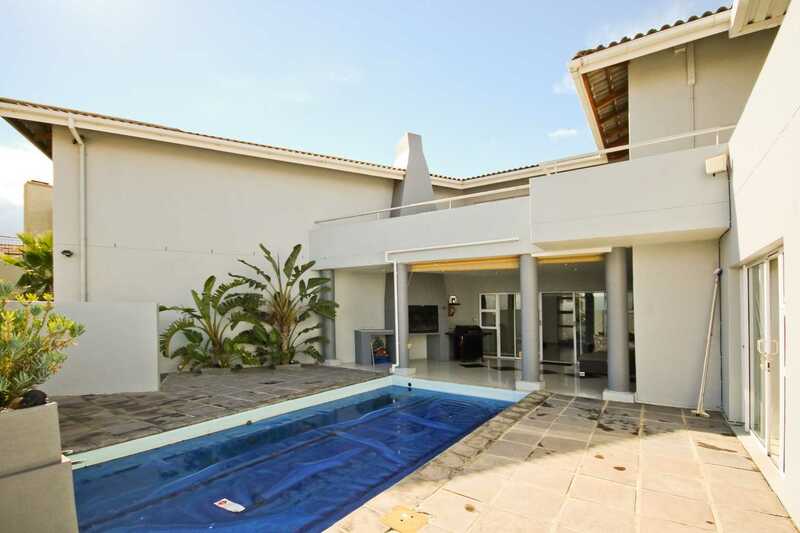 This 2 storey home offers the perfect setting for relaxing and entertaining.